“The region comprises of a lot of emerging markets, where the power and energy needs are growing rapidly. Customer needs are evolving in tandem and are becoming increasingly complex and demanding. At FieldCore, helping to address their needs for optimum performance, while ensuring business continuity is top priority.” – says Razak Yaacob, Resource Director for FieldCore Asia Pacific & China, who believes that field services are at an exciting time in the region. Having worked in the industry for over two decades, Razak has seen a lot. But for him, recruiting and developing the right professional talent has always been a critical factor to the success of a company. Having established operations in the Region on December 2017, year 2018 for FieldCore was about stabilizing the business, and `talent’ was a critical enabler to helping us achieve this. Throughout 2018, a number of recruitment drive and thought leadership activities were carried out by the Asia Pacific Team with top engineering universities. The goal was to build awareness of FieldCore as an attractive employer and establish relationships to develop a talent pipeline primarily targeting students and graduates from Mechanical Engineering, Engineering Physics, Materials Engineering, and Electrical Engineering. Outreach initiatives were carried out throughout the year with universities such as Institut Teknologi Sepuluh Nopember, Surabaya, Indonesia and the Institute of Technical Education in Singapore, among others. The initiative was well received by students and faculty members who commended FieldCore’s commitment to support the country’s goals of strengthening job opportunities for citizens. The team closed the year with a bang, with two important engagements, in Korea and Malaysia. In Seoul, Korea, a seminar was held on 28 November at DanKook University. Moongoo Kang (Service Manager), Jiwon Yoon (Mechanic), Seo Sukryu (Human Resources Generalist) led a session with a group of 100 engineering students to introduce FieldCore and highlight the company’s goals of nurturing local talent with training and exposure to field operations internationally. The initiative was well received by students and faculty members who commended FieldCore’s commitment to support the country’s goals of strengthening job opportunities for Korea’s citizens. 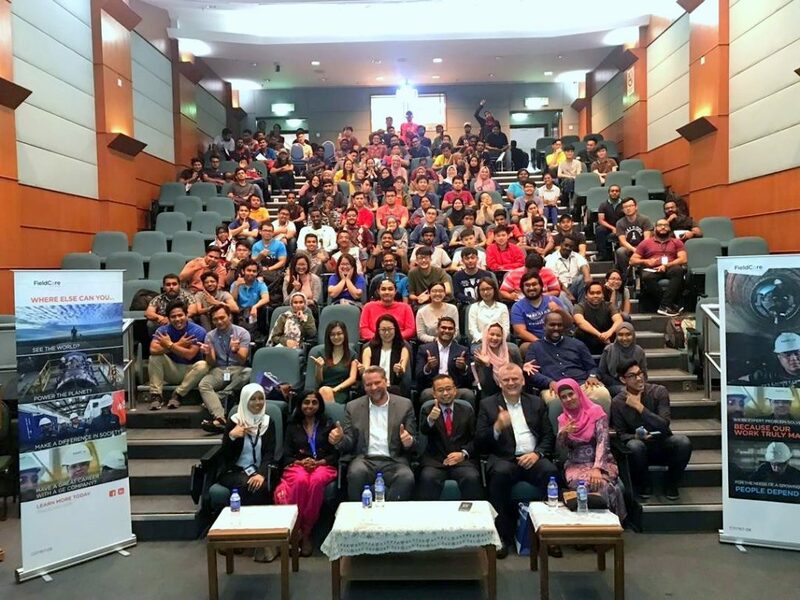 In Malaysia, FieldCore conducted a session on 5 December, at Universiti Tenaga Malaysia featuring Mike Adams (President and CEO of FieldCore). Mike led an engaging session with over 300+ students from the engineering and IT faculties, during which he spoke about his career journey starting out on the fields of Algeria, as a junior field engineer. The event served as an opportunity to cultivate our relationship with the country’s leading energy university, owned by Tenaga Nasional Berhad, Malaysia’s national electricity utility, and a key GE and FieldCore customer. · Flexibility: We offer options for flexible work arrangements for many of our roles. · Career growth: A wide range of career paths enable our employees to grow their careers at FieldCore and within the GE family. · Diverse and Inclusive: With our Unique and Inclusive diversity program, we celebrate uniqueness and work in partnership for the benefit of all as one Team. In 2019, we hope to continue with our efforts to engage with the right organizations to meet our talent needs. Expect to hear more from the FieldCore team, as we continue to cultivate talent as a key component to our strategy to become the world’s best execution company in field services operations.